This post may contain affiliate links. See my disclosure page here for more details. The other day my 2 year old daughter and I watched Frosty the Snowman, and it inspired me to do a snowman inspired activity with her. There are a ton of snowman inspired learning activities out there! I have wanted to work on numbers and counting with my daughter so I whipped up this cute Snowman Counting Activity. This snowman math activity is a great way for your kids to work on number recognition, rote counting, one-to-one correspondence and fine motor skills. Each snowman top hat has a number on it and your child is to place the matching number of buttons on the snowman. We used buttons but play-dough or pompoms can work just as well. This simple Snowman Counting Activity is a fun and engaging math game that your kids will enjoy. For my toddler we used the numbers 1 through 5, but for older children you can go beyond that. Draw a snowman on the white cardstock. I traced 3 different sized plates then count out the snowman shape. Give the snowman a cute face! Don’t forget the carrot nose! If you like, you can glue your snowman onto another sheet of cardstock like I did. Draw 5 top hats, cut them out then number them. Simply place a numbered hat on the snowman then ask your child what number it it. Then ask her to place the same number of buttons on the snowman to dress him. The number on the snowman’s hat needs to match the number of buttons on his tummy. Although, my daughter can rote count 1 to 10 fairly well, she has difficulty with one-to-one correspondence. This means that when she counts she sometime skips an object and continues to count, or will count an object more than once. For this reason, I wanted to focus on the numbers 1 to 5 in this activity. However, this activity is very flexible and you can adjust if your child is familiar with larger numbers. Don’t have time to try this now? Pin it for later! 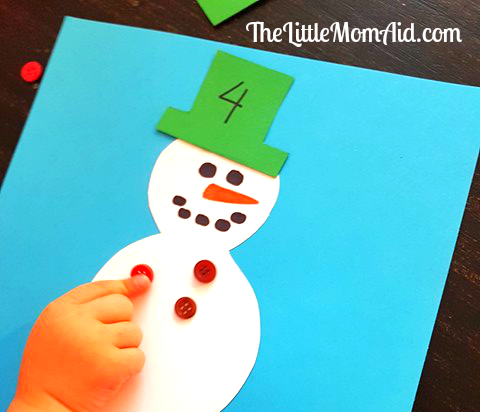 Have you tried this Snowman Counting Activity? If you tried out this activity with your kids or students let me know! I would love to hear about it so leave me a comment! You can also tag me on Instagram @thelittlemomaid or use the hashtag #thelittlemomaid. Follow me on Instagram, Pinterest and Facebook! Need more activities for the kids? Such a teacher!! I love it! Great post as usual! Thank you! I am so glad you liked it! So many learning activities included. Colors, numbers, drawing, and shapes. Great fun for both mom and child. This is such a cute activity. I’m definitely going to try it with my almost 4 year old. Fun activities make all the difference. I hope your little one has fun with this! I have got to do this with my son. I bet he would love it.